sorry for starting a thread for a (probably already solved) problem like this, but i couldn't find any answer in the help library nor the internet..
how can i arrange the "color picker" in photoshop cs the same way as in painter? and in photoshop i can only pick my colors by first clicking at the foreground/background color in the toolbar and then choosing my color from a color picker.. a bit annoying i think. Not a shabby idea actually. 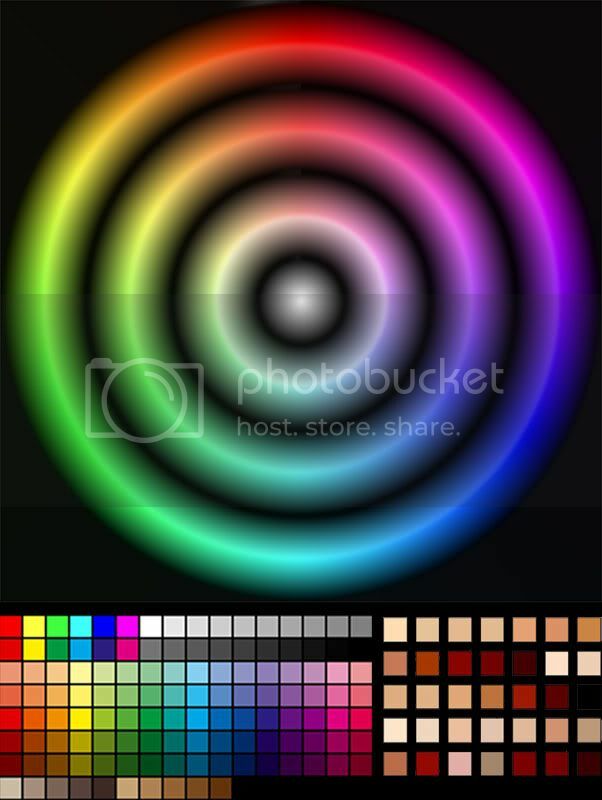 Anyone have an idea of how to make a unifrom color wheel that goes through all colors and values? I would actually use that quite often. Just paste it into whatever you are working on and sample from it. EDIT: started making one actually, but it's hard to cram everything into one color wheel. EDIT2: Is it possible to create a new photoshop popup window with a color wheel image in it? Not just an open image but a window that is integrated into the program. That would be very cool. Last edited by dfacto; May 22nd, 2005 at 11:10 AM. Well, I did cram everything in, going by steps of 20% saturation through the color picker. Also put in some skin and general swatches. Not super great, but could be fairly useful for fast colo picking. Comments? Last edited by dfacto; May 22nd, 2005 at 04:38 PM. great idea on that color wheel, dfacto! i guess it could prove as useful..
still, i am bothered that i cannot switch the color wheel in photoshop because at 1280*1024 the hsg or rgb-color-picker is just really tiny and it's not easy to pick the exact color i like very fast..
Yeah, it really is annoying. It would be great if you could create a custom palette with your own image to sample from, but after some looking around I think that would require the SDK and code work. Bleh. I always despised the colour whell in painter, photoshop and flash mx have the best ones IMO. That colour wheel thing you made is nice, but do you have a hi res version of it? Highest I have is 1000x1300 or so. It's in .psd format with both versions in there. You could scale it up more though, since the colors and not the sharpness are important. anyone else has a solution on this? maybe some of the professionals that use photoshop all the time? how do you deal with the "color-picking-process"? I suppose if you have a generally pastel color palette like Bengal you could use a custom color table fairly efficiently. Otherwise I don't really think there is some magic trick to it aside from either sampling from an image or just using the built in pickers. Adobe will never adopt the Painter color picker (just trust me on this one); no sense in waiting or hoping for it, so here are some alternatives/hints/tips. 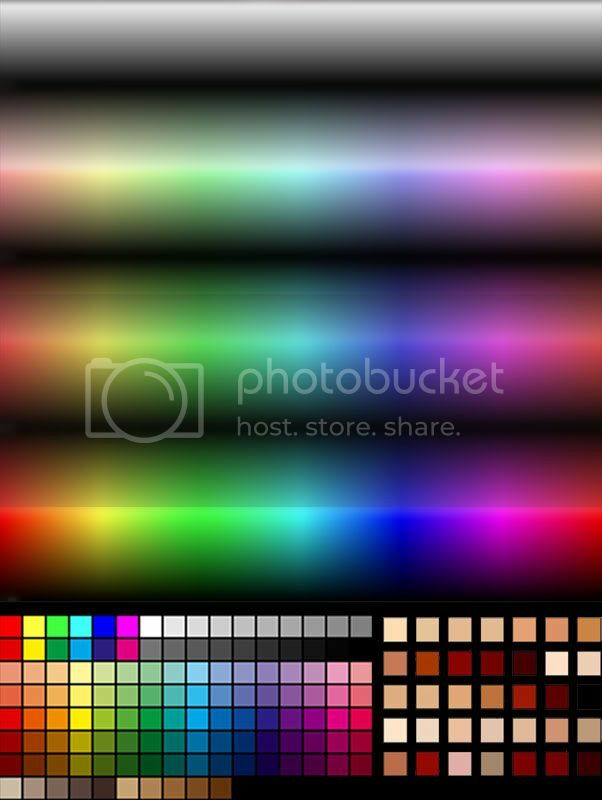 First of all, Painter is based on HSB (Hue, Saturation and Brightness) color theory, so change your PS color picker to that mode using the wing menu in the upper right of the palette. Secondly, if it's a matter of "dialing in" a specific hue, the up and down arrows in any Photoshop text field will increment that value by 1 up or one down, respectively. Holding down the shift key while using the arrow keys changes this by 10 instead of one. I find this faster than using the mouse if I want to dial in just the right color, but your mileage may vary. Third, don't be afraid of using the Swatches palette - in fact, I find that ripping it out of its palette group (click and drag on the tab) is pretty useful so that I can see both the color picker and the swatches palette at the same time. Working on an extended series of pieces? Save the swatches set and even share it with other artists on your team. Don't be afraid to blow away the defaults, they are a cinch to restore. Every piece I do, I find some core colors, drop 'em in as swatches, and then all I have to do is vary either the paint blending mode or the lightness of them as I model volume in the piece. First I've seen people with small dots of color in their image. My guess is these people are color picking from these for their base colors and then adjusting value and saturation in the sliders. From recent experience I found these also helps tie your colors into the background, assuming you paint the background before the dots. Those are my ideas anyway, I'm still getting a handle on the basics of painting though and would really like to hear how the pro's deal with this. Photoshop CS3 color picker question?? ?